Although they’re pretty closely related, video calling and video meetings are not quite the same thing and when people assume they offer exactly the same features and benefits, it can get confusing. Whilst regular video calling services allow for live face-to-face video communication, they have some crucial differences from specialist videoconferencing service that business users should be aware of to fully understand the maximum potential of enterprise video communications. Sometimes be referred to as “point-to-point” calling (describing direct calling between two video devices) to help differentiate it from videoconferencing. In a business context, video calling can be seen as an agile way to streamline workflows by allowing individuals to connect quickly in a more efficient way than email, chat, and other communication tools. Face-to-face communications can allow team members to get faster answers, speed up decision making and repsond quicker to requests. Video calling can be thought of as the equivalent of calling between two telephones; the call doesn’t have to be scheduled, with most services intended for making calls between two video users/devices. Video calling is sometimes referred to as ad hoc calling to further differentiate it from scheduled video meetings. Related: The Conferencing Shoot-Out: Audio, Video, or Web? Professional services: calls are made via a dedicated video network, via either a cloud or on-prem solution offering reliable, business-grade video performance. The ability to connect to external video networks varies between service providers. This functionality to connect with other platforms is known as “interoperability.” Being interoperable means different technology platforms can communicate efficiently together. This is particularly important for business users since the ability to connect to users outside your company network should be high on the list of priorities for business video. It greatly restricts the potential of your communication strategy if you’re not easily able to speak to external stakeholders. Free services: Many do support some form of screen-sharing, but the functionality can often be limited and difficult to use. Also, because the video performance is lower and less reliable, this can greatly impact productivity. Professional services: simple functionality for a smoother screen-sharing experience and HD video quality help people have productive conversations with colleagues as and when they need them in addition to scheduled meetings. Traditionally this would be what most people think of as videoconferencing. 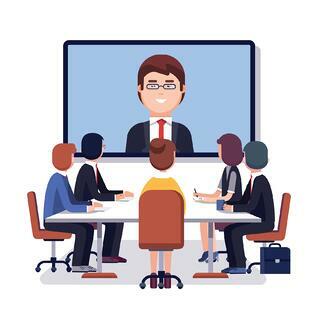 Video meetings offer real-time collaboration for large numbers of people by using a “meeting room”, or VMR (virtual meeting room), specifically designed to facilitate shceduled participation of many video users at the same time. Multiple participants can work together face-to-face, wherever they are in the world, share presentations, web pages, and more, with screen-sharing capabilities. Closer collaboration for people in separate physical locations offers faster workflows for any distributed team or projects, from long-term projects, weekly sales meetings, to company all-hands meetings. Whilst there are free “online” meeting services and apps, they will offer a few obvious drawbacks for business users. Firstly, since they’re web-based, the interoperability factor will come into play. Users will be limited to how they join a meeting. Getting users on other services or networks to join is very difficult or not possible. Professional meeting services by contrast, make it easy to invite almost anybody to a meeting in a few seconds. By providing a simple dial-in process for users on each supported network— purpose-built videoconferencing devices (SIP/H.323), WebRTC (joining through a regular web browser without downloading any software), as well as other supported apps and networks, it only takes a few seconds for guests to join a meeting, no matter how they choose to join. And like video calling, using a professional meeting service means all your meeting participants are calling over a dedicated video network, rather than just using the public internet for better video quality. Additionally, security for free services will not be as robust as a paid solution. Proper call and media encryption is a must when you’re hosting video meetings with 50 people to discuss and share commercially sensitive information. Videoconferencing can be used as an interchangeable term with video meetings in that it's describing a conference call happening on video, but videoconferencing could also be thought of more broadly to cover professional business video communication, both calling and meetings/conferences, with an emphasis on collaboration between multiple video users. It’s important to note as well that whilst there are many “videoconferencing” solutions out there, there are few that actually offer both video meetings and video calling in one platform, with many offering either a meeting service or a calling service. And lastly, professional videoconferencing solutions will offer extra functionality beyond video meetings, such as integrations with traditional audioconferencing platforms or streaming/recording functionality to help you do more with videoconferencing.